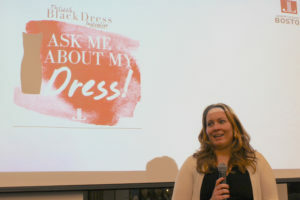 Winter 2019 General Membership Meeting Recap - The Junior League of Boston, Inc.
Lindsay Farrell, the chair of the 2019 Little Black Dress Initiative, shares information about the program. Recently, The Junior League of Boston hosted its annual winter General Membership Meeting (GMM) focused on the theme of leadership. To kick-off the meeting, Michelle Lentz, President, shared inspiring quotes related to the theme. Each quote resonated with members, especially, “A leader takes people where they want to go. A great leader takes people where they don’t necessarily want to go, but ought to be”, spoken by Rosalynn Carter. Members were then asked to describe a leader in one word. As women buzzed with excitement, they agreed on words like “inspiring”, “supportive”, and “collaborative” as great adjectives to describe an empowering leader. 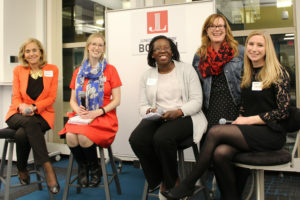 Members then had the chance to ask the Board of Directors and Executive Management Team questions focused on their hopes for the Junior League of Boston, what their favorite social event is, and how to balance life and League obligations. The meeting closed with members feeling inspired, empowered and ready to take on 2019! Training: In addition to regular trainings, our Training Council organized all-day trainings and opportunities such as the Board Seat Initiative, Mentorship Program, and the Conference Grant Fund, where JL Boston members can pursue outside training opportunities through a grant to offset registration and related costs. Little Black Dress Initiative: Did you know that in every 98 seconds, someone in the U.S. is sexually assaulted? Every 11 minutes, that victim is a CHILD and only five out of every 1,000 perpetrators will end up in prison. The LBDI is back, and we are looking for advocates to bring awareness to the distresses of poverty and violence against women, and the impacts they can have on a woman’s access to resources, her confidence and professional opportunities. Learn more about the LBDI, and use our hashtag #LBDIBoston to start the conversation. Become an advocate today! Nominate a leader: We are currently accepting applications for the 2019-2020 Board of Directors and Executive Management Team. Interested in applying or learning more? Visit the Nominating resources page, complete the online application form, or email jlbnominating1819@gmail.com. We also have immediate leadership opportunities that you can apply for, as VP of Community Service Elect, VP of Communications Elect or VP of Technology Elect.